- The original owner hung himself on Apr. 3rd, 1926 but no one knows why or where. - The house once was a funeral home and today the old embalming room is now the queen bedroom in the Remington Suite. - In the 1950's locks were installed on both sides of every door, it was possible to lock someone inside or outside of every room, closet, bathroom, including the basement and the attic. The house as it looked about 60 years ago. "This 1895 mansion may still be home to its original owner. Guests have reported hearing doors close when no one was there, seeing objects move on their own and seeing a man at the foot of the bed. 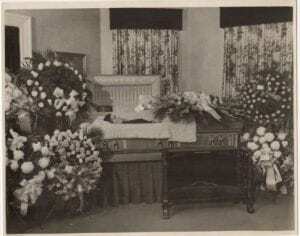 This man is thought to be the home’s original owner, Richard Martin Lester, who committed suicide in it in 1926. The mansion is divided into four guest apartments." “Cause of Death: Strangulation by hanging, suicide. 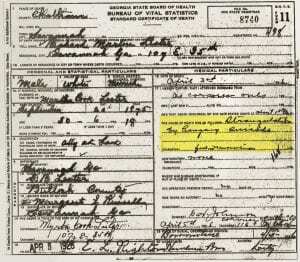 Duration: few minutes” reads the death certificate dated Saturday, April 3rd, 1926 of Richard M. Lester, the first owner of the house . There’s no information regarding where in the house Mr. Lester was found. Richard Martin Lester Richard Martin Lester Mr. Lester grew up on Drayton St. across from Forsyth Park, earned his law degree from Yale, and lived in the house with his wife Victoria and their two daughters. Morning Death Notice lists St. John’s Church as location of the funeral. R. M. Lester Death Certificate The funeral was held at the house at 4:30pm, Monday April 5th 1926 and burial was at Bonaventure Cemetery immediately afterwards. 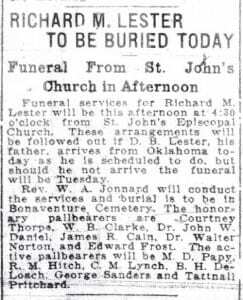 The only clue I’ve found as to a possible motive might be that his father, Daniel B. Lester, who was also an attorney, was due to arrive in Savannah two days later from the Oklahoma Territory. On Monday morning his father’s train arrived, he was met by friends, told the news and that afternoon he attended his only child’s funeral. Mr. Lester's grave as it looks today. “R. 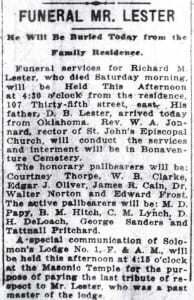 M. Lester Rests in Bonaventure” is the obituary title. 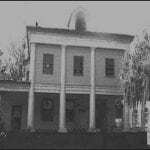 occupied the house in the 1960’s and a former employee told me how he’d delivered the bodies through the kitchen door, performed the embalming in a back bedroom and then laid out the deceased in the bay window of what is now the dining room of the Remington Suite. In the middle of the night a guest from Michigan saw a man standing at the foot of the bed watching her, she screamed, he vanished. The Remington Suite Queen bedroom was the embalming room. For some unknown reason a previous owner installed deadbolt locks on both sides of every door, including every closet, pantry and bathroom door.